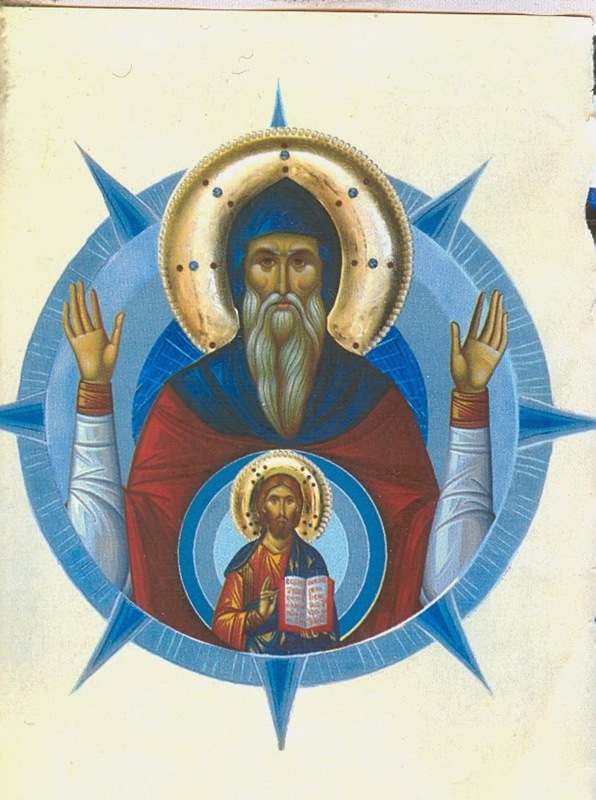 "Saint Simeon the New Theologian was born in the year 949 in the city of Galatea (Paphlagonia), and he was educated at Constantinople. His father prepared him for a career at court, and for a certain while the youth occupied a high position at the imperial court. 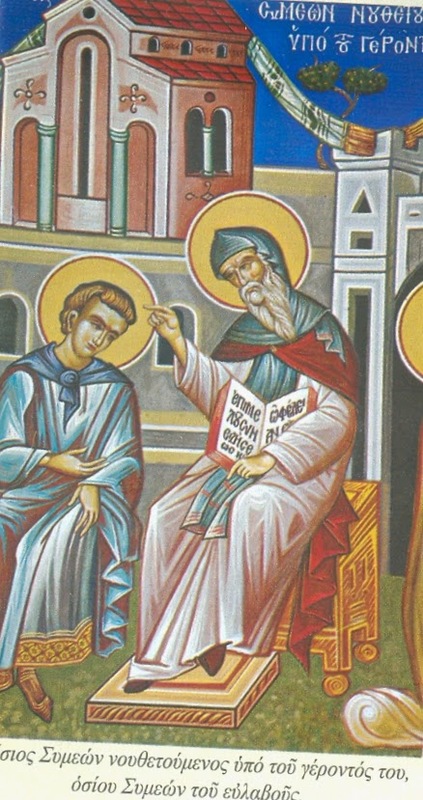 When he was fourteen, he met the renowned Elder Simeon the Pious at the Studion Monastery, who would be a major influence in his spiritual development. He remained in the world for several years preparing himself for the monastic life under the Elder's guidance, and finally entered the monastery at the age of twenty-seven. 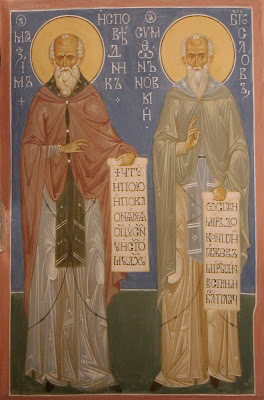 St Simeon the Pious recommended to the young man the writings of St Mark the Ascetic (March 5) and other spiritual writers. He read these books attentively and tried to put into practice what he read. Three points made by St Mark in his work "On the Spiritual Law" (see Vol. I of the English PHILOKALIA) particularly impressed him. First, you should listen to your conscience and do what it tells you if you wish your soul to be healed (PHILOKALIA, p. 115). 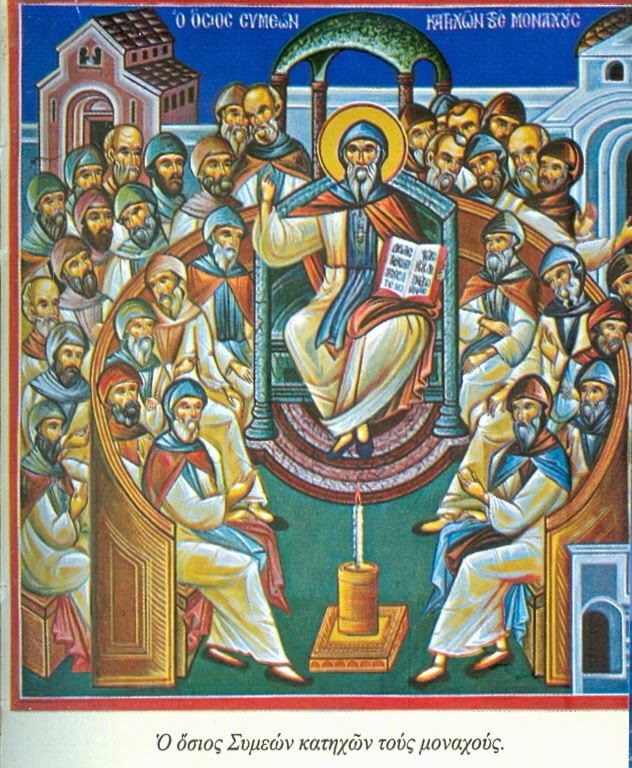 Second, only by fulfilling the commandments can one obtain the activity of the Holy Spirit. 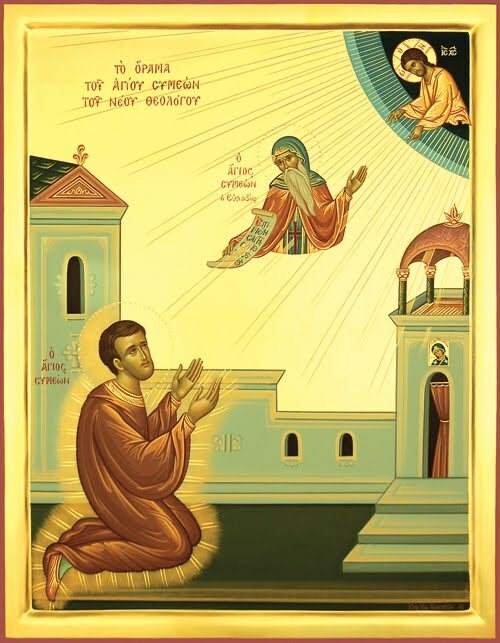 Thirdly, one who prays only with the body and without spiritual knowledge is like the blind man who cried out, "Son of David, have mercy upon me (Luke 18:38) (PHILOKALIA, p. 111). When the blind man received his sight, however, he called Christ the Son of God (John 9:38). 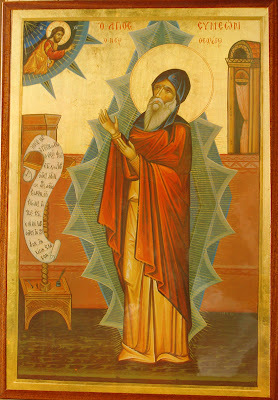 St Simeon was wounded with a love for spiritual beauty, and tried to acquire it. In addition to the Rule given him by his Elder, his conscience told him to add a few more Psalms and prostrations, and to repeat constantly, "Lord Jesus Christ, have mercy upon me." Naturally, he heeded his conscience. It seemed to him that he himself became light. Then his mind rose upward to the heavens, and he saw a second light brighter than the light which surrounded him. 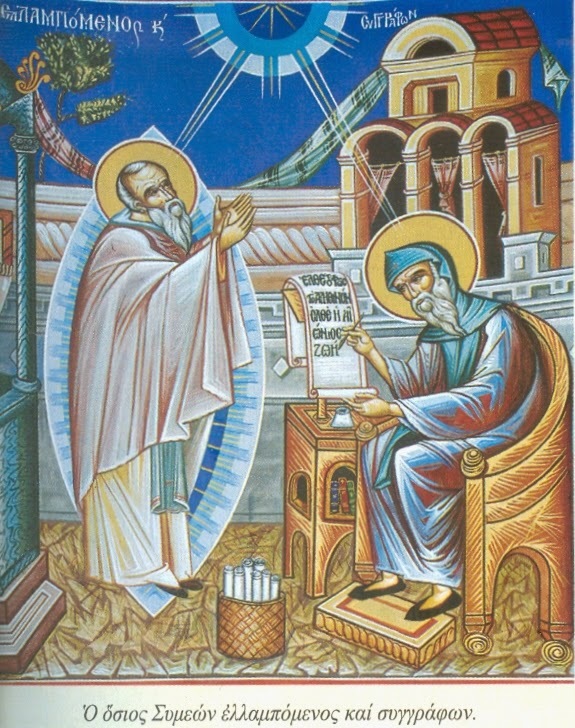 Then, on the edge of this second light, he seemed to see St Simeon the Pious, who had given him St Mark the Ascetic to read. 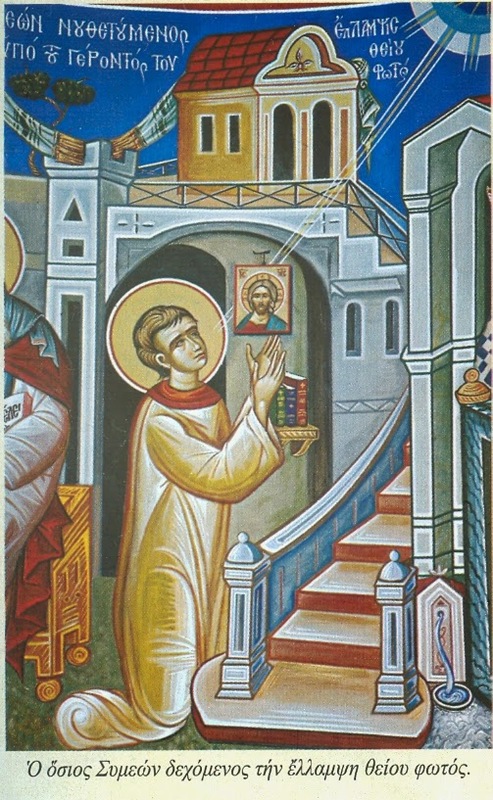 Seven years after this vision, St Simeon entered the monastery. There he increased his fasting and vigilance, and learned to renounce his own will. The Enemy of our salvation stirred up the brethren of the monastery against St Simeon, who was indifferent to the praises or reproaches of others. Because of the increased discontent in the monastery, St Simeon was sent to the Monastery of St Mamas in Constantinople. Around the year 980, St Simeon was made igumen of the monastery of St Mamas and continued in this office for twenty-five years. He repaired and restored the monastery, which had suffered from neglect, and also brought order to the life of the monks. The strict monastic discipline, for which St Simeon strove, led to great dissatisfaction among the brethren. Once, after Liturgy, some of the monks attacked him and nearly killed him. 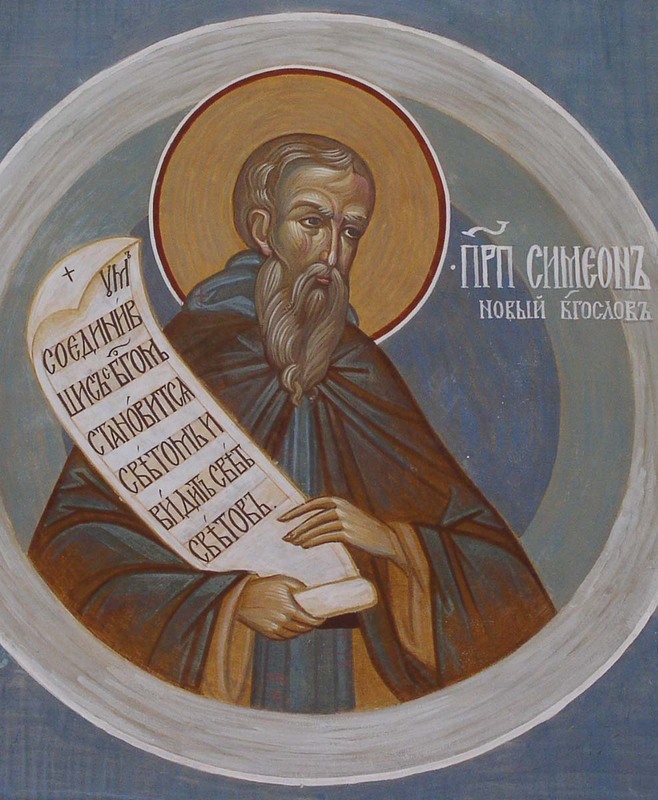 When the Patriarch of Constantinople expelled them from the monastery and wanted to hand them over to the civil authorities, St Simeon asked that they be treated with leniency and be permitted to live in the world. 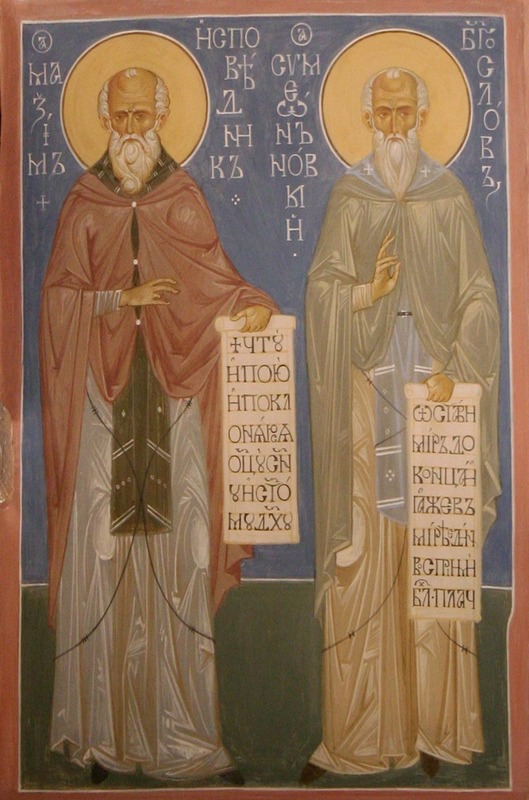 About the year 1005, St Simeon resigned his position as igumen in favor of Arsenius, while he himself settled near the monastery in peace. 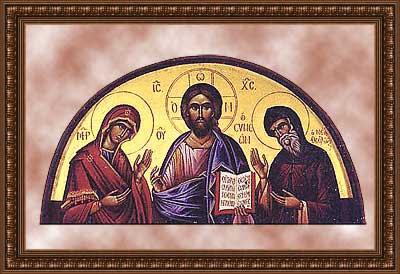 There he composed his theological works, portions of which appear in the PHILOKALIA. The chief theme of his works is the hidden activity of spiritual perfection, and the struggle against the passions and sinful thoughts. He wrote instructions for monks: "Theological and Practical Chapters," "A Treatise on the Three Methods of Prayer," (in Vol. IV of the English PHILOKALIA) and "A Treatise on Faith." 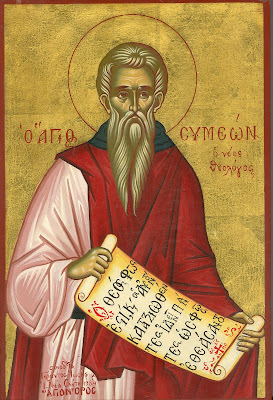 Moreover, St Simeon was an outstanding church poet. He also wrote "Hymns of Divine Love," about seventy poems filled with profound prayerful meditations. The sublime teachings of St Simeon about the mysteries of mental prayer and spiritual struggle have earned him the title "the New Theologian." These teachings were not the invention of St Simeon, but they had merely been forgotten over time. Some of these teachings seemed unacceptable and strange to his contemporaries. 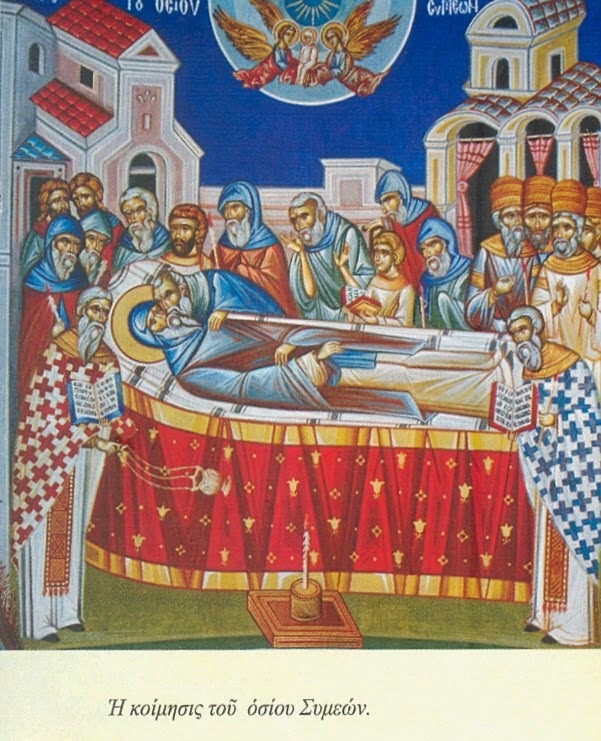 This led to conflict with Constantinople's church authorities, and St Simeon was banished from the city. He withdrew across the Bosphorus and settled in the ancient monastery of St Makrina. 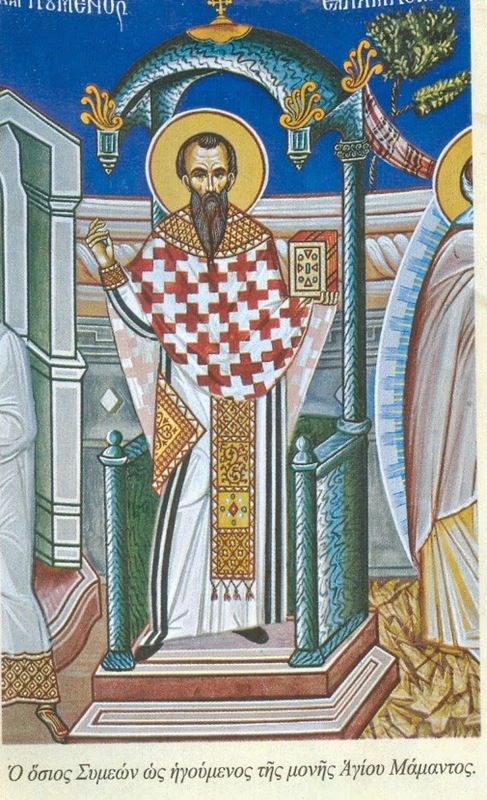 His Life was written by his cell-attendant and disciple, St Nicetas Stethatos. "The roof of any house stands upon the foundations and the rest of the structure. The foundations themselves are laid in order to carry the roof. This is both useful and necessary, for the roof cannot stand without the foundations and the foundations are absolutely useless without the roof—no help to any living creature. In the same way the grace of God is preserved by the practice of the commandments, and the observance of these commandments is laid down like foundations through the gift of God. The grace of the Spirit cannot remain with us without the practice of the commandments, but the practice of the commandments is of no help or advantage to us without the grace of God." "For those who believe in Him, Christ will become all this and even more, beyond enumeration, not only in the age to come but first in this life, and then in the world to come. Thou in an obscure way here below and in a perfect manner in the Kingdom, those who believe see clearly nonetheless and receive as of now the first-fruits of everything they will have in the future life. Indeed, if they do not receive on earth everything that was promised to them, they do not have any part of foretaste of the blessings to come, their higher hope being set on the hereafter. However, it is through death and the resurrection that God in His foresight has given us the Kingdom, incorruptibility, the totality of life eternal. Given these conditions, we unquestionably become partakers of the good things to come, that is, incorruptible, immortal, sons of God, sons of the light and of the day, inheritors of the Kingdom of Heaven, since we carry the Kingdom within." 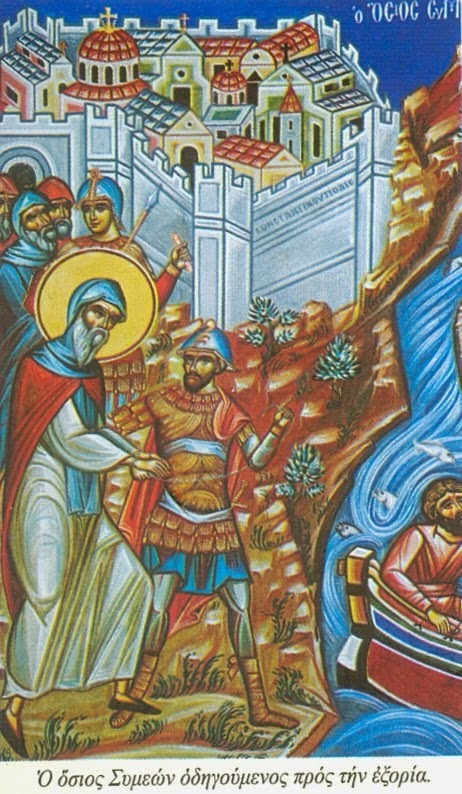 For St. Symeon's "On The Beatings of Our Lord", see: http://full-of-grace-and-truth.blogspot.com/2009/10/on-beatings-of-our-lord-by-st-symeon.html. Since thou hadst received within thy pure soul God's enlightenment, O righteous Father, thou wast shown to the world as a blazing light which drave away its thick darkness and moved all men to seek the grace of the Spirit which they had lost. O all-holy Father Symeon, intercede with Him to grant great mercy unto us who honour thee. 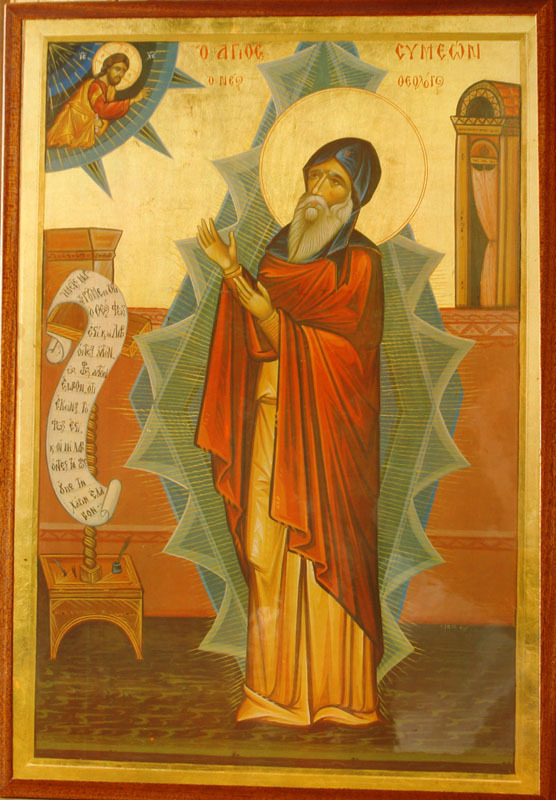 May St. Symeon intercede for us!